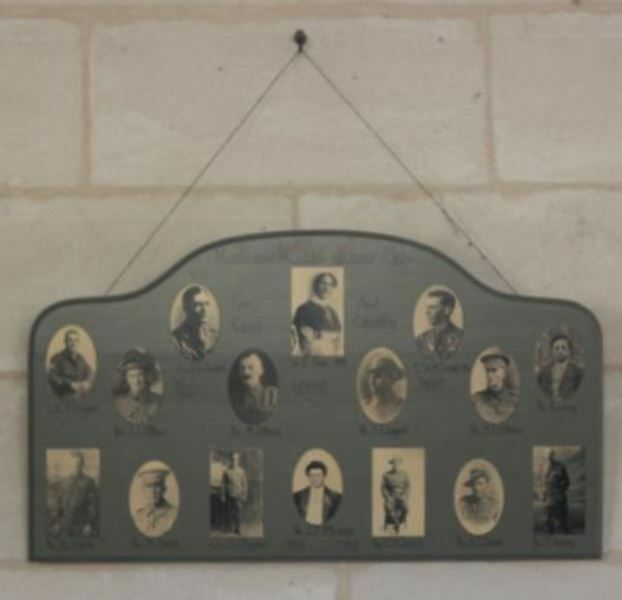 A photographic honour roll commemorates past scholars and teachers of the Mumbannar School who served in World War One. To commemorate the services done in the world war by the past scholars and teachers of the State school, Mumbannar, the School Committee had placed in the school an honor roll containing the photos of one nurse and fifteen soldiers, who at one time went to the school. On Saturday. November 27, this honor roll was unveiled by Mrs J. O'Brien, the mother of a fallen soldier, in the presence of a large crowd of people. The chairman (Mr Pratt) and Messrs Thomas, M.L.A., Robertson and Lightbody delivered speeches appropriate to the occasion, and Kipling's Recessional and the national anthem were sung. The ladies provided afternoon tea, and Mr Thomas, M.L.A.. treated the children to some lollies. During the war the school raised £131 15/ for patriotic purposes, as well as supplying various articles of clothing regularly to the Red Cross. The honor roll was the work of Messrs Arthur and Sons. Mount Gambler.